Paula began her career in the field of addiction treatment in 2001 when she qualified as an Auricular Acupuncturist working in detox units and with addiction services. She continued in education and obtained a certificate in Counselling Skills, a diploma in Women’s Studies and a Bachelor of Science degree in Psychology from Queen’s University. Paula spent many years working with people living with and affected by HIV, dealing with stigma, discrimination, isolation, anxiety, depression and addiction. 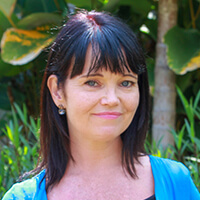 She also worked with individuals experiencing homelessness as a result of addictions and co-occurring mental health diagnosis, which prompted her to return to university to complete a certificate in the Teaching and Management of Literacy and Essential Skills and afterwards to obtain a PTTLS certification in Education and Training. Paula’s passion to educate and empower people to seek recovery led to further training and education in evidence-based CBT and Family Interventions. She continued to work therapeutically in communities and as a therapist in in-patient care at Castle Craig Hospital. In her current role with The Cabin as a Primary Counsellor, she continues to utilize her skills in group facilitation as well as individual counselling.